When patients experience dental damage or decay, the Conklin & Ward Dental Group team is here to help with conservative treatment options that repair damaged tooth structure and preserve your healthy, natural smile. Two of the restorative dentistry services we provide most often are dental crowns and bridges. These restoration options allow us to restore lost tooth structure and replace missing teeth. If you want to find out more about dental crowns and bridges, call our Towson dentist and dentistry team to schedule a restorative dentistry consultation appointment today. We’ll examine your smile and help you find the right restoration options. Dental crowns are restorations that fit completely over the top of a damaged or decayed tooth to repair the smile and protect remaining dental structure. 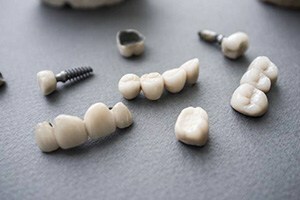 We can offer dental crowns made from a variety of materials to help patients achieve their desired results, including gold, porcelain fused to metal, zirconia, and all-ceramic. Dental bridges are restorations used to replace one or a few missing teeth. A replacement tooth is fused to two dental crowns, one at each side. The crowns are affixed to healthy teeth surrounding the lost tooth, recreating the natural smile flawlessly. Dental crowns and bridges are placed over the course of two visits to our Towson dentistry office. 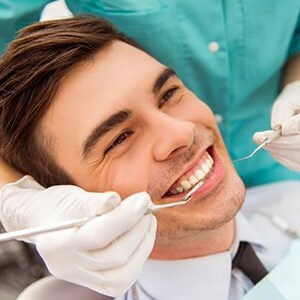 During the initial appointment, we’ll prepare teeth, capture bite impressions, and place a temporary to protect your smile while our lab crafts your final crown or bridge. Once we receive the custom crafted, high quality dental restoration from our lab, you’ll return to the office, so we can exchange your temporary for the custom dental crown or fixed bridge. Do I Need to Care for My Dental Crown or Bridge Differently? 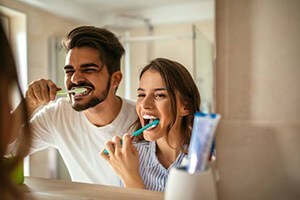 For the most part, you can simply continue to brush and floss your teeth as usual, but we may recommend making some changes to your oral hygiene products. In order to preserve your crown and bridge restoration and avoid excessive dental wear, you should use a soft bristled toothbrush and minimally abrasive toothpaste. We can make recommendations for specific products during your dental appointments, so don’t hesitate to ask. You should also switch to a waxed floss or water flosser to avoid pulling or tugging around the edges of your restoration during flossing. 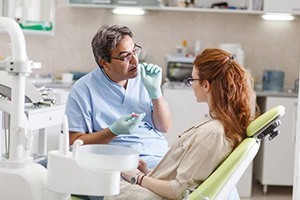 When you visit our Towson dental office for twice a year dental exams and cleanings, we will carefully assess your restoration for damage and help you keep the crown or bridge looking and feeling great for years to come.